I’m really trying to ramp up my writing volume at the moment. Partly because I’ve got so much to do on my personal projects, and partly just to try and improve my writing skills. The most consistent advice I come across is to not over analyse it and just plonk your bum down and write. Daily. 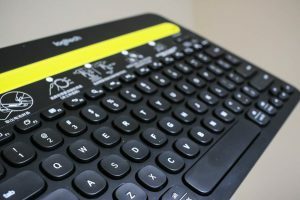 This is just a short post on how I found, used and liked the Logitech K480 bluetooth keyboard to help me do this. To that end – I’ve been thinking about how I can make best use of all the incidental little free moments that come and go during the day. On the surface of it – I don’t have much time, between working full time and looking after a 14 month old bundle of energy (just me and my wife). The day can start anywhere from 4am. In an ideal world I can wake up first, go downstairs and do an hours work on the Mac before he wakes up – but that happens rarely at the moment. I usually wakes when he does, and if I’m lucky I can grab a few minutes of writing and catching up before work. Conversely, after work – by the time he’s been bathed and fed, played with and put to bed, most of the remaining free time is taken up with all the adult type things you have to do (and not the interesting ones – I’m talking about paperwork, chores and tidying around). Getting proper, quiet focused time can be a rare treat. So I was thinking about how I could make better use of the little windows of time that present themselves during the day. Those times where I find myself just flicking around on my phone – reading hacker news, reddit or staring blankly at imgur. Lost time in between things. Or time when concentration is split – such as when you’re watching TV – being semi-social, not really engaged in what’s on the box, but not really doing anything constructive instead. I was mulling over this while on holiday in Macau recently, experiencing the same issues – wanting to write whenever a few free minutes presented themselves, but not having anything useful to write with. 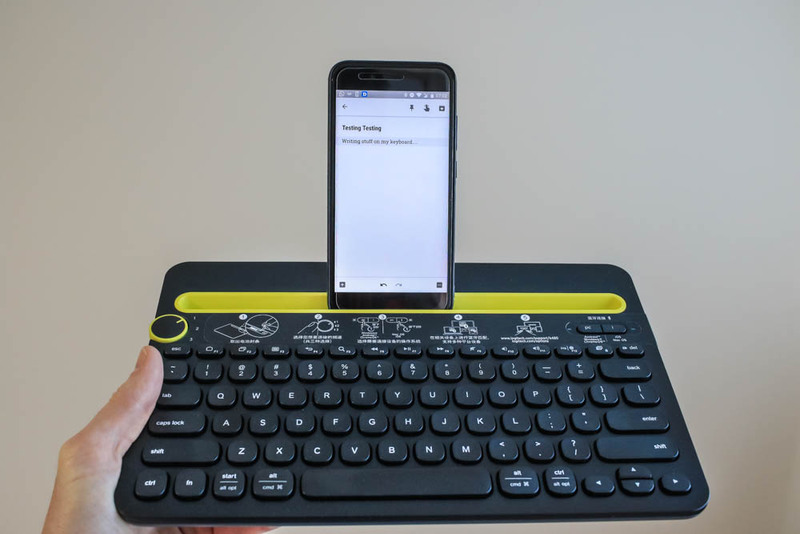 I often use Google Keep to take notes that flit into my head, but its hard to write anything substantial on a phone virtual keyboard. Googles voice recognition works pretty well for dictation – but it’s not always convenient to do that – and I haven’t really trained myself to work that way (as yet – although it is something I’d like to explore further). I could go old school with paper and pen, but I’ve lost any ability I had to write quickly or legibly by hand after so many years of using a keyboard. that looked much more substantial (note: I was still in Macau at the time – and ordering from taobao there is easy – there are small local shops you can use as your address to get things delivered to from mainland China). The reviews seemed ok so I decided to give that a try, figuring that it would be better to try a better keyboard to see if I would actually work that way, than get a smaller one that may be more portable but may be so difficult to use it puts me off the idea completeley (for the wrong reasons). When it arrived I wasn’t sure I’d made the right decision. It looked about as large and heavy as a laptop (compared to my old MacBook air). Had I made a terrible mistake? It was a bit fiddly to get it connected to my Xiaomi Android A1. It just didn’t seem to pair despite doing everything corretly (there wasn’t that much to do – it’s pretty simple). After some googling 0 it just turns out there is a rogue space in the box where you type in the PIN. Hit backspace a few times before typing and it worked ok. Frustrating to say the least. However, once that was fixed – it worked absolutely fine (aside from frustratingly swithing from English to Chinese keyboard whenever I hit the shift key – but that’s down to my setup really, and once I’d wored out what was going on wasn’t too bad). It was so easy to work with too. I kept it by the side of the bed. If I was awake at night, or woke up early in the morning – it was the simplest thing to switch the keyboard on, ope Google Keep app and just start typing. My workflow is just to output stream of consiousness type outpourings, without worrying too much about spelling or editing. Then later, when I’m on a laptop I can copy and paste the text to wherever it needs to go (website, scrivener, word etc) and tidy it up then. A common complaint is that the keys are quite noisy – which they are, but I don’t mind that to be honest. I prefer the more mechanical keyboards to the squidgy apple ones (I prefer my old MacBook Air keyboard to the new MacBook Pro – especially with the cursed Touch Bar travesty). It is large and fairly heavy too – so much so that I doubt I’ll ever take it travelling (abroad, at least). Even though it’s a bit unwieldy to take away on holiday – It’s already proved it’s worth just by using it at home. It’s proved to me that a bluetooth keyboard + phone is a viable combination to write with. I’m already writing more that I did before when I just used a laptop. 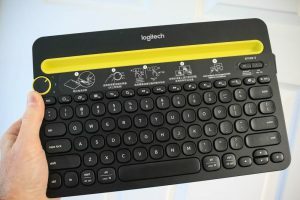 I can also be much more cavalier with the Logitech K480 bluetooth keyboard – keep it down the side of the bed, or side of the couch without worrying about damaging it (as I would with a laptop). I also don’t need to worry about the battery (the existing batteries should last a couple of years according to Logitech). I’m not saying its superior to writing on a computer. It’s not. But it’s a bit like a camera – the best one is always the one you have with you. So when I’ve got 15 mins free, sat in bed – whereas before I wouldn’t walk downstairs to get a laptop, now I can just reach down, pick up the keyboard and start streaming some ideas. And if I fall asleep in the middle and it falls off the bed – well, I don’t lose any sleep over it.